Our recent series of vehicle crossings across Cornwall’s River Fal stirred memories of previous crossings such as in Malaya where a motorised pile of logs transported a crowded bus over a swirling jungle stream. Perhaps the Townsend Thoresen tragedy was the worst incident one can think of. A visit to Feltham’s tank testing facility spelt out, in model form, how carelessness in closing the main bow doors allowed water to sweep through this modern ferry and caused it to capsize. I heard the case being tried at The Old Bailey – so sad. 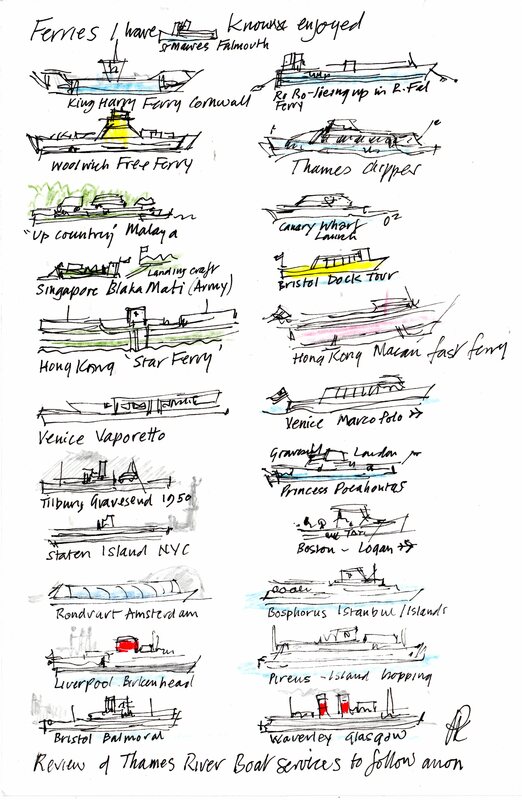 Ferries have always intrigued me – the Star Ferry in Hong Kong, the Venetian Vaporetto – the Staten Island Ferry , to name just the most glamorous that I have travelled on. Now on London River we have the sleek Thames Clippers which originated in Sydney, Australia – one can now catch a Clipper from Blackfriars Pier (next to the new cross-river station) up to Putney – a commuter service which also serves Chelsea and the massive new developments on the south bank at Vauxhall. Dear old Greenwich relied on ferries once – prior to the foot tunnel and, of course, the Blackwall Tunnel. Watermen were outraged as their trade was depleted. Down by Deptford Creek ferries thrived – the horse drawn ferries to the Isle of Dogs on the site of Wood Wharf served the ever growing docks at Millwall. One remaining pedestrian-only cross-river ferry still plies between Canary Wharf and Hilton Docklands (for Canada Water). I wonder if this was once the Ford Ferry boat between Belvedere and Dagenham. A less publicised ferry runs between the O2 and Trinity Buoy Wharf where the Thames Clippers are based. The Woolwich Free Ferry mustn’t be forgotten – a great family treat when it was steam propelled! Countless watermen plied their trade within Docklands as well as to and fro amongst the shipping in the River. The Gravesend – Tilbury ferry is an essential pedestrian link – years ago I can remember our family Vauxhall being carried on board (pre Dartford Crossing M25) on our way to Newquay in Cornwall! For a cruise from Gravesend up river to Greenwich phone 01732 353 448. I wonder if there will be a ferry for workers at the new Thames Gateway Port across to Gravesend?